Believe it or not, the Pittsburgh Steelers still have a shot to qualify for the 2009-10 NFL playoffs. I fall on the side of "can't believe it", but given the world of sports we're living in, nothing should be a surprise anymore. The world's best golfer has seen his pristine image turn into a excuse to start TMZSports.com. Arguably the best college football coach in the game resigned, changed his mind, and decided on a leave of absence in a 24-hour span. 16 teams were vying for the services of the Pirates' closer, which I believe is an oxymoron. These are all things I never would have anticipated. But as I often say, in sports you should expect the unexpected. So of course the Steelers could lose five in a row, including Cleveland, Oakland, and Kansas City, and qualify for the postseason. It's as unexpected as any of the above scenarios we watched unfold in front of our very eyes in 2009. 1. Was this a game the Steelers won or a game the Ravens gave the Steelers? In the end, it will be looked at as a little bit of both, but I'd go with the latter more than the former as theories go. The Ravens had 11 penalties for 113 yards, with eight coming in the second half. Two of those 11 penalties wiped out touchdowns. They had two plays of 20 yards or more to the Steelers' five. They dropped easy touchdown passes. They turned the ball over three times. These are not things that equate to victory, especially on the road in front of a hostile crowd. So to see the Ravens come up short should be no surprise. On the other hand, the Steelers made plays when they had to, they didn't collapse in the fourth quarter, and they committed far few miscues. As I said, it's not unfair to say that they earned some of this victory as well. 2. The flow of the game was unusual to say the least. After putting up 20 points in the first half, including a beautiful drive in the closing moments, the Steelers managed only a Jeff Reed fourth quarter field goal in the final 30 minutes. Their offense was basically invisible for the entire third quarter, possessing the ball twice, resulting in a Roethlisberger interception and a three-and-aht. But the Ravens' drive which took the game into the fourth quarter is what basically decided the contest. You don't see many 10-play, 5:18 drives that result in 14 yards of offense, but that's what happens when you commit four penalties on the same drive. The Ravens had a Willis McGahee TD come off the board, Derrick Mason dropped a second touchdown on the drive, and a 15-yard personal foul on Oniel Cousins ultimately took the Ravens out of field goal range. It was a clinic in beating yourself. At a point in the game when most people reasonably expected the 2009 Steelers' defense to collapse, things fell into place with a little help, and a bullet was dodged. The D would go on to force Baltimore into a three-and-out on the Ravens' next possession; in their final possession, the Ravens victim to LaMarr Woodley sacks on consecutive plays, virtually ending any chance for victory. Meanwhile, the Steeler offense recovered just enough from the atrocity that was the third quarter to compile one scoring drive of eight plays and 44 yards, resulting in the deciding Reed three-pointer with 5:25 left in the game. It was a tad unconventional, but the fact is that this win counts just as much as a 63-0 W in the standings (and in the playoff hunt). 3. The Steeler offense continues to have the feel of a pass first, pass second, run third mentality, as was the case again on Sunday. The Steelers attempted 33 passes and 23 runs, to Baltimore's 25 passes and 38 runs. But the rushing attack was mostly ineffective, generating only 48 yards from Rashard Mendenhall and a Very Special Cameo from Willie Parker. As the season plays out, it is apparent that the NFL has in general become a pass-first league, and the Steelers have been wise to follow that rule of thinking, winning Super Bowl 43 behind the league's 23rd-ranked rushing attack. Oh, by the way, their opponent for that game - the Arizona Cardinals - were ranked dead last in the league in rushing in 2008. The fact is that the league's top quarterbacks almost universally equate to the top teams. Tom Brady, Peyton Manning, Drew Brees, Philip Rivers, Carson Palmer, even Brett Favre are all having excellent seasons, and their teams are likewise leading their divisions. The blueprint is obvious: throw to win. And why is this? The rules make it advantageous. If there were a loophole to save money on your taxes, you would take advantage of it, right? That's how fans should be looking at passing games. Defenders can't breathe on quarterbacks without being flagged or fined. DBs have never faced such stringent enforcement of pass interference rules. Think about it - how many really fantastic corners are there in the league? Does Ike Taylor really look as bad as we make him out to be, or is he merely par for the course? The bottom line is that the game is slanted to the advantage of the pass, and smart teams are taking advantage of it. Aside from Adrian Peterson, take a look at the top five leaders in rushing. There's Chris Johnson, on the 7-8 and once 0-6 Titans; Maurice Jones-Drew, on the 7-8 Jaguars; Steven Jackson, on the one-win Rams; and Thomas Jones, of the 8-7 Jets. In fact, of the top 10 rushing leaders, only two of them (Peterson and Cincy's Cedric Benson) play for division leaders. Conversely, of the top 10 rated passers, all of them are either in the playoffs or still alive for the playoffs, and that same list houses four of the six division-leading QBs, the only exceptions being Kurt Warner (11th) and Donovan McNabb (17th). So don't be mad at the Steelers for their game plan. They're merely following the formula for success in today's NFL. It may not have worked out so neatly in 2009, but if you ever have any doubt, be sure to check out that sixth Lombardi Trophy the next time you're in the city. 4. The Steelers' excellent collection of receiving weapons came through in a big way on Sunday. Mike Wallace continued to exhibit his knack for the big play, with a 45-yard grab; Santonio Holmes was targeted 12 times and turned that into 86 yards and a score; and Hines Ward continued to play while dinged-up, contributing four catches for 37 yards. The only disappointment was when rookie Tyler Grisham had a drop, giving him a total of one first-down celebration and one third-down drop on the day. 5. LaMarr Woodley had an excellent game, with 10 tackles and those two key sacks in the fourth quarter. After a very quiet start, Woodley has come on to the tune of 11.5 sacks on the season, which is exactly the number he finished with in 2008. 6. It was nice seeing first-rounder Ziggy Hood out there wreaking havoc on Sunday, even in small doses. I'm really expecting great things out of Hood in the future, as are the Steelers, and his sack and fumble recovery against the Ravens is a glimpse of great things to come. I hope. 7. Congratulations go out to a few Steelers for statistical milestones coming during Sunday's game. Ben Roethlisberger became the first Steeler QB to throw for 4,000 yards in a season, a fact that simply blows my mind. How could that have never happened in the long history of the franchise? Elsewhere, Rashard Mendenhall eclipsed the 1,000-yard mark, with 1,014 yards on the season. The team did not have a back run for 1,000 last year, meaning the last player to do so was Willie Parker with 1,316 in 2007. Parker led the team with 791 in 2008. Hines Ward and Santonio Holmes have joined the 1,000-yard club as well. It's the first time for Holmes, whose previous high was 942 yards in 2007. It's the sixth time for Ward, whose high is 1,329 in the Tommy Maddox days of 2002. The Steelers now have two 1,000-yard receivers (Holmes and Ward), a 1,000-yard rusher and a 4,000-yard passer for the first time. Stefan Logan also set a Steeler record for kick return yards in a season, so I'm guessing that the chance taken on him in 2009 would be considered a good move. 8. I see the Bill Cowher rumors are heating up once again, with Tampa Bay as the leading contender. Despite their win over the Saints on Sunday, the Bucs are a certifiable disaster, but there is no state income tax and the weather's certainly nice. If The Chin wanted to build a team from the ground up, this would probably be a good opportunity. 9. As we all know, the Steelers close the 2009 regular season next week at Miami, with a 1:00 start. The Dolphins are coming off a disappointing 27-20 home loss to Houston on Sunday, a game in which they found themselves down 27-0 at halftime. So it will be interesting to see how they respond after being all but eliminated this week. 10. 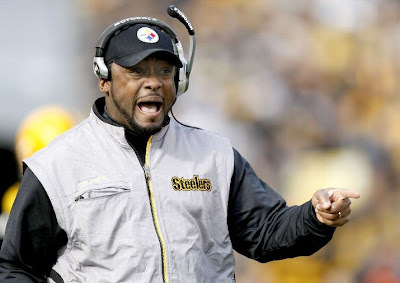 Now that we've got all the serious stuff out of the way...go back to the top and check out that pic of Mike Tomlin. Is it me, or are those some Santa-sized bags under his eyes? I think he's aged at a Presidential rate during the 2009 season. I think what is more interesting is that while the Ravens KILLED themselves with penalties, there were some major ones for which they were not flagged that resulted in big plays for them. Heap's push off of Townsend 2 plays after Tomlin berated an official for missing hole-opening 'habeous grabus' on Harrison was huge. So was Foxworth knocking Santonio down very early to make that pick. The Ravens have some real talent, but they need to keep it together. Ray Rice is an excellent back and they still have a good enough front 7 on defense to make some noise. I thought that we made plays when we had to yesterday, but also missed a few opportunities that really could have blown to game wide open. We had a few open WRs either over/underthrown or completely ignored, a bad drop by Mendy, a huge missed sack, and a couple of slip downs also by Mendy that immediately come to mind. But a win is a win and Woodley was huge in the clutch. There is still some hope, but those missed opportunities will have to be hits come Sunday and/or playoffs. Nothing new for the Ravens. They've been killing themselves with penalties all year. Did anybody watch the Green Bay/Baltimore game? There was like 300 penalties in that game. Both the Packers and the Ravens are terrible when it comes to penalties. A win is a win, but this one is downright embarassing. I think we need to run more empty sets...not. It is a guaranteed sack every time. I notice that you didn't post what the Steelers would need in order to make the postseason but looking at it, it's very very possible. 3) Oakland beats Baltimore, Kansas City beats Denver, and Cincinnati beats NY Jets. I'd say the most likely scenario is that the Pats beat Houston and Cincinnati beats the Jets. I don't see the Ravens losing to the Raiders (irony noted), and I don't see the Broncos losing to Chiefs (irony once again noted). I'm not expecting them to make the playoffs. The Steelers certainly don't deserve to make it. However, it would be nice for them to make it. You never know. Just remember the playoff run from a few years ago. Big Ben WILL suffer sacks on 3rd down in empty AND single back sets. Twice I saw Arians have the sense to go max-protect with two backs flanking Ben I believe. It's just such a scattershot, feast or famine offense that he runs. Ok, now the 3rd and long play we ran is something I want to talk about. I personally would've ran it, taken the clock down to a 1:10, and tried to pin Balt deep. But I was not totally opposed to passing for it to try and put the Ravens away. But how about a nice, high percentage pass? One where at worst, we don't get the first down, but we keep the clock running. Once Ben escaped trouble, there was NOBODY underneath to dump it off to . Sure it worked out when a Raven held Mike Wallace (which partially led to the interception). But why the hell are you running guys 30 yards downfield?? You need 10 to end the game, and at worst a completion of any kind to pin Baltimore deep with about a minute on the clock. Plus, he does seem to run the same stupid plays that never work in the same situations. Ben WILL line up in the shotgun and get sacked in the red zone. It is basically set in stone as long as Arians is the coordinator. And to think that we actually have to root for New England to win a game...I'm as big a Steeler fan as any, but i've resigned myself to looking forward to the draft. And watching Fast Willie's last game as a Steeler.